This insightful book is packed with examples of core skills and techniques. The text shows how to do intakes, how to pace clients, and how to use probing to gather client information. Most importantly, the book illustrates how to use specific interventions, such as directives, reflective questions, and narrative techniques. You’ll find dozens of examples and hands-on practice ideas. 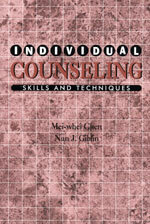 Individual Counseling shows how to make connections between the counseling skills students learn and the actual implementation of those skills. It includes helpful hints for dealing with client rambling, ways to handle confrontation, how to write case notes, and much more.